Created through a 'student-tested, faculty approved' review process, "COMM" is a concise, visually appealing text that introduces essential speech communication concepts without any delays or distractions. This brief, affordable paperback includes a full suite of learning aids to accommodate your busy lifestyle, including chapter-by-chapter study cards, self-quizzes to help you review the most important concepts, downloadable flash cards, interactive video, Audio Study Tool review downloads, and Speech Builder Express 3.0 features that let you study wherever you are, whenever you have time. Designed for today's students in every detail, this unique solution was developed through conversations, focus groups, interviews, surveys, and input from nearly 150 students like you. 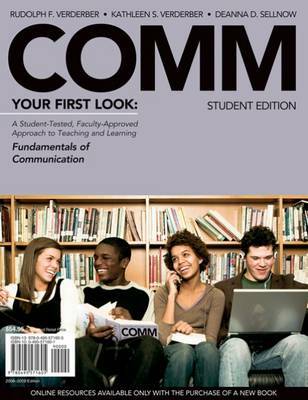 From its abbreviated, no-nonsense title, to its useful content and engaging style, "COMM" is the perfect introductory speech communication text for modern learners.